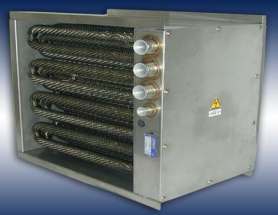 The electric duct heaters have been developed to satisfy the need of temperature controlled air or gas flows which is present in several industrial processes. The are designed to be inserted into ventilation ducts, tubes, ovens or autoclaves and are directly flown by the process air or gas. The heating elements are finned to increase the heat exchange. However, if the heated fluid contains particles which could clog the fins, the duct heater is manufactured using smooth heating elements.